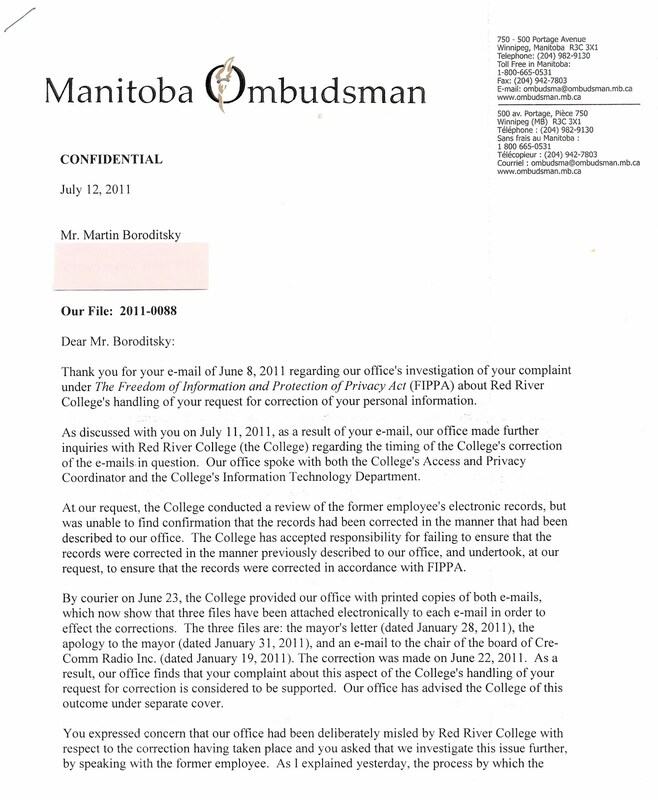 The Manitoba Ombudsman has discovered that Red River College, which teaches journalism students about the importance of Freedom of Information laws, committed a breach of the Protection of Privacy Act. The discovery was made after College officials had assured the Ombudsman that a false allegation regarding Winnipeg Mayor Sam Katz had already been corrected using required protocols. Instead the falsehood - repeated to at least 4 people by former vice-president Cathy Rushton - that Mayor Katz had complained to former College president Jeff Zabudsky about The Great Canadian Talk Show, remained on the official College files for 4 months. 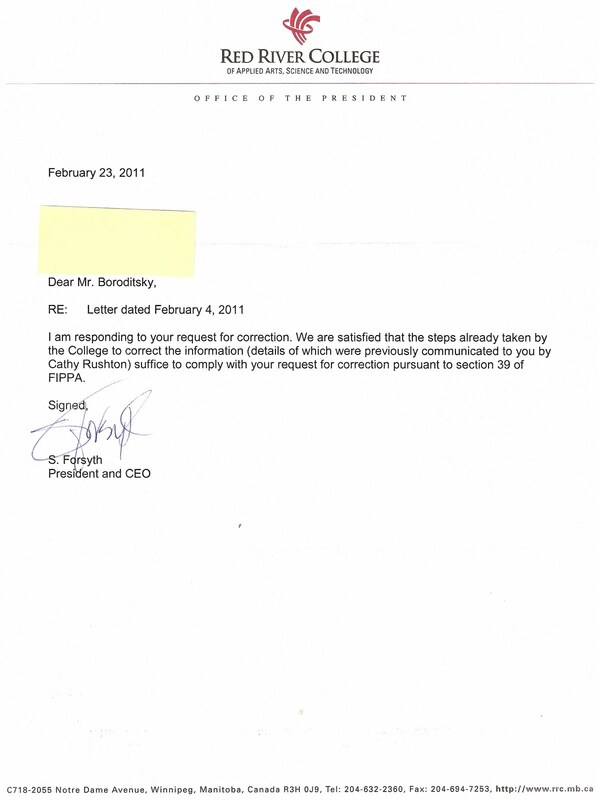 After learning of the false allegations when an Access to Information filing uncovered Rushton's emails about Katz to 2 other College vice-presidents and 2 members of the Kick-FM Board, show host Marty Gold acquired a letter from Katz describing claims he had ever complained about the show as "patently false". Gold insisted Rushton attach that letter to the files as part of a formal correction, to ensure the defamatory allegation was neutralized within the College record-keeping system. Rushton outright refused, and Gold complained to the "Head of the Public Body" who is ultimately in charge of records kept by RRC, president Stephanie Forsyth. 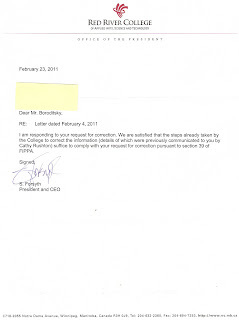 Gold demanded the correction be done under the formal steps outlined in outlined in Section 39 of The Freedom of Information and Protection of Privacy Act (FIPPA) and also complained about Rushton's conflict of interest - she was the designated Chief Privacy Officer and was therefore responsible for ensuring College records were accurate, but had refused to correct emails on file of a defamatory allegation she herself had spread. Forsyth wrote back stating she was "satisfied" with Rushton's actions and that the requirements of the Act had been met. 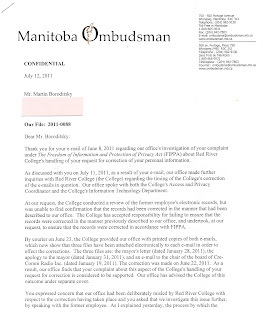 Gold then filed a complaint with the Ombudsman that the College had refused to correct a disputed record in the legal manner required. At first, a report from the Ombudsman stated that College officials claimed to an investigator that the correction had been entered on the files, and the complaint was denied. But Gold wrote back to the Ombudsman, Irene Hamilton, personally, suggesting the investigator had being misled and that documented proof of the date and method of the correction to the files was required, given Rushton's stated refusal and her conflict of interest, and Forsyth's subsequent dismissive reply. "As a result, our office finds that your complaint about this aspect of the College's handling of your request for correction is considered to be supported." The attempt by Red River College to brush off the Ombudsman's Office and preserve the false allegation unchallenged and on the record failed miserably. This stands as a lesson about the rights of any Manitoban to be treated fairly by public institutions -- you can't take anybody's word that they've corrected a lie about you that they spread; always insist on documented proof.